This month’s news includes: A Royalties cheque for Kidderminster Railway Museum | ‘Blue book’ out of print! | When does ‘recent memory’ become history? | Personnel records, family history – and a mystery! Continuing steady sales of ‘Second Edition: Speed with Safety’ have allowed Polunnio Ltd to write a second Royalties cheque – this time to Kidderminster Railway Museum. Whilst Chippenham Museum & Heritage Centre carries out sterling work to protect the Chippenham-based heritage of Westinghouse Brake & Signal, the main photographic archives are held at Kidderminster where they are available to the general public. The KRM is well worth a visit, and we are proud of our continuing association and shared passion in protecting the photographic records of the remarkable achievements of those that served at Westinghouse for such a long time. ‘Blue book’ out of print! The last few copies of the reprint of ‘WB&S in Chippenham in Photographs’ have now been sold, although if you’re lucky, you may find a copy at Chippenham Museum & Heritage Centre. This represents much higher levels of sales than was ever anticipated, and we are delighted that so many people have wanted to buy this reminder of life at the Chippenham site between 1894 and 1981. We are currently looking at levels of interest in this book, and considering either a ‘print on demand’ solution – or perhaps making an ‘e-magazine’ version available on this website. Watch this space!! When does ‘recent memory’ become history? We have recently been given a large folder of 35mm photography of various mass transit projects carried out by Westinghouse – and later Invensys Rail – from the 1960s to the mid 1990s. The subjects are global – ranging from London Underground to Hong Kong, Singapore and beyond. These photographs will eventually end up with the rest of the archive. For the Polunnio team though these projects are very much within ‘living memory’ – it’s a real shock to look back at work carried out 20 years ago, and to suddenly realise that it has become history!! Can’t do much about the passage of time. 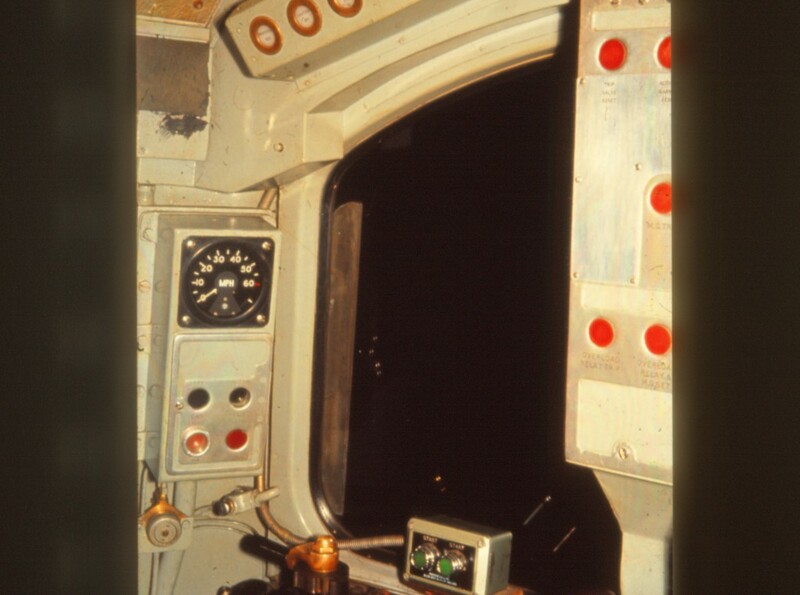 In the meantime here is one of those photos – we believe that this is the cab of a train being used on the 1963 trials of Automatic Train Protection and Automatic Train Operation (i.e. the train driving itself from station to station) on the Hainault Loop of the Central Line, ahead of the 1968 opening of the Victoria Line. Look for the ‘start buttons’ by the window. If you know different – let us know. Personnel records, family history – and a mystery! Finally for this month, we are often asked whether personnel records are available – usually by people who have found an ancestor with a link to Westinghouse and who would like to find out more. Unfortunately we are unaware of any personnel records existing for any of the Westinghouse companies until very, very recent times – and those are clearly protected by data protection and confidentiality laws. We know that during the Second World War the Administration Offices of the King’s Cross Head Office took a direct hit – Ossie Nock refers to many drawings being lost at that time, but doesn’t mention the ‘people records’. There are of course ways of finding people – for example a quick search in the ‘Westinghouse Review’ documents show Labour leadership candidate Jeremy Corbyn’s father at work in the ‘Building 121’ Laboratory at Chippenham in the late 1940s. Engineering drawings do have signatures on them (and most of those documents from the 1890s through to today are still stored in digital format), and of course our own publications refer to scores of people who played a significant role in the history of the Company. We will always happily try to help anyone researching family history, but we cannot guarantee too much. If you need help regarding a ‘Westinghouse ancestor’, or know more about the whereabouts of some of the long-lost personnel records, then do contact us.